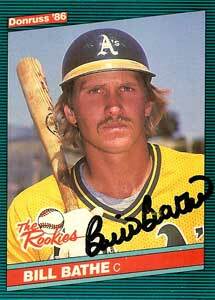 Bill Bathe talks about his time with Canseco in the minor leagues. 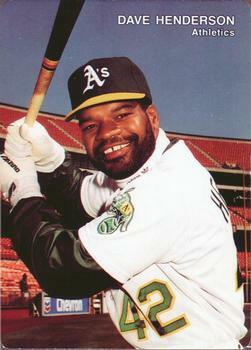 Bill Bathe played catcher in the Major Leagues for 3 years, including time with the Oakland A’s in 1986. I found this story on his website (http://pro-baseball-drills-and-equipment.com/stories/jose-canseco/) and found it to be interesting. He now lives in Tucson, Arizona and is captain of the Tucson Fire Deapartment. Enjoy. Playing along side Jose Canseco, this is my account of my playing days in the Oakland A’s minor leagues. I had an opportunity to play in Tacoma and Oakland with Jose along with Mark McGwire. When Jose was first playing in the minors, he was a young kid. Not weighing very much and skinny in stature. In the low minors he hit few home runs and struck out a lot. He was signed by the A’s after a recommendation by a scout. He was not a high pick. It was noticed that after his average year in single A, he came to spring training the following year looking like Charles Atlas. Jose Canseco had gone from being skinny to the hulk. After talking to Jose, I proposed the question to him about what he was doing to increase his size and strength so dramatically. He replied that he was lifting weights 8 hours a day. I balked at this and asked him again how he was doing it and he replied that he was taking steroids. The next season, Canseco went on a rampage hitting wise. He started tearing up the league in double A and was soon promoted to triple A where he joined me on the Tacoma Tigers. He proceeded to tear up the triple A league also and when we played in Vancouver, an interesting thing happened and was amusing. While playing a game and after the opposing team could not get him out, when he appeared for his next at bat, on the score board appeared, “Now batting, Roy Hobbs”. So Roy Hobbs was born in the Pacific coast league and he was hispanic with unbelievable bat speed. He remained with us for the short remainder of the season. When we played at home, we played in Cheney stadium in Tacoma Washington. The center field fence is a long ways away, some 400 and something feet away with a towering green monster that rises at least 50 feet. In my 4 four years at Cheney stadium, I never once saw anybody hit one over that fence. Not only was it a long way away with a towering wall, the temperature was always damp and the ball did not carry very well. When Jose Canseco joined us at Cheney stadium, it was the first time I saw an opposing team stop what they were doing to watch Jose hit. You could have heard a pin drop. Jose was launching balls consistently over the center field wall and also putting them over the light tower in left center field which was also a herculean feat. I had never in my life witnessed such power. It was truly amazing to watch. Senor Roy Hobbs! I had asked Jose if he thought steroids had helped his performance on the field. His reply was that it had. He felt that steroids allowed him to play at the level he was at. Now the real question is, how is this going to effect him long term. I can say this, Jose has changed in a lot of ways. I have known him for quite awhile and he used to be easy going. Seeing him now on interviews and other occasions, I can honestly say that he is a changed man. Time will tell what effects will have on Jose. I can only hope that it doesn’t cause him any morbidity or mortality. That would be a shame for a short time of glory.My advice is to stay away from steroids. The effects are long lasting and not worth the risk.